Value-focused medical device product leadership. One of systems engineering’s core functions is to understand the user needs for a product or service, and seamlessly translate those needs into design requirements. We’ve helped our medical device customers do this for many years. A complete set of user needs is worth its weight in gold, as it minimized surprises during validation which may include product redesign! Recently, we’ve begun “practicing what we preach,” to better understand our customers needs. Once we have fully vetted our customers’ needs (overlaid with the business and employee needs), they can be translated into our product and service offerings with a sound justification. My favorite process is still “Voices into Choices: Acting on the Voice of the Customer.” I used this process back in my days at Covidien (now Medtronic). It’s out of print, but available used for a few bucks. We’ve just started defining our objective statement and identifying our matrix of customers. We’ve identified some unique areas of exploration, even before speaking with our first customer. We wrote a paper on using Voice of the Customer in medical device development. Check it out here. As noted in my previous blog post, I attended and presented at the INCOSE Conference on Agile in Healthcare last month. Here is my presentation. 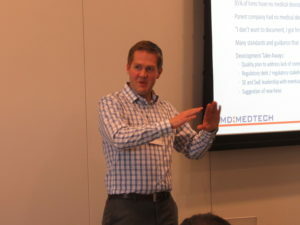 It was great to hear perspectives on being agile in healthcare product development, and discussing best practices with many thought leaders from major medical device manufacturers. I picked up two ideas that I’d like to investigate further and integrate into CMD’s processes as it makes sense. First was the concept of agile practices in hardware development. While I don’t think a full-on scrum methodology makes sense for hardware (though it can be done with modified sprint cycles), I do appreciate the simplicity of a kanban-style backlog and project management process. In addition to kanban, I received some great insight on how to better integrate software and hardware development into sprint cycles. Second, I’d like to investigate the SAFe agile framework further (P.S. : not an endorsement of SAFe). SAFe extends agile methodologies to the project and enterprise levels. A couple of medical device manufacturers with highly mature product development processes are using SAFe (or customized versions of it). It requires a good bit of tailoring to fit within a Quality Management System, but if done well, I think it has great potential for developing and maintaining a streamlined portfolio of safe and effective products. Many medical device manufacturers and developers (including us) use agile principles to develop medical devices. Done properly, medical devices can be developed more efficiently while still meeting guidance, standards, and regulations. Unfortunately, many companies don’t do enough to ensure design controls are appropriately implemented when using agile during product development… whether it’s just for software, or the entire product development process. At the INCOSE Conference on Agile Systems in Healthcare on May 23 and 24, we’ll be presenting our direct experience with the FDA and medical device manufacturers. What does an inspector think of agile? How have medical device companies done it right (and wrong)? We’ll answer questions like this and have an open discussion on efficient, real-world implementation of agile in healthcare. Join us! We’ve kicked off company operations in March. It’s been a long time coming! One of our first tasks is to wrap up our Quality Management System (QMS). Lucky for us, ISO 13485:2016 has finally been published. I like the changes– they provide more detail around some critical activities like verification and validation, and ensure risk management is used throughout the QMS. ISO 13485 has begun its divergence from ISO 9001! No notified bodies are certifying to the 2016 version at the moment, but we’re going to bake it into our QMS to ensure we’re ready to roll when the time comes. Along with conforming to ISO 13485 (2003 and 2016), we conform to 21 CFR 820 and the Canadian Medical Devices Regulations (SOR 98-282).